I’ve always considered myself a bit of a foodie. Lucky for me, State Street‘s landscape is ever-changing, with new restaurants coming in and out all the time. Whenever I see a new restaurant on State, I have to try it. Glaze Teriyaki moved into its State Street location just last summer, and it’s been my go-to take-out dinner option ever since. I try to eat healthier meals as much as possible, and that’s the main reason why I love Glaze. Glaze provides hungry students with a well-balanced meal, including a hefty portion of meat, rice, and a side salad. I’ve tried many of the protein options at Glaze, and while I love the chicken and steak, my all time favorite is the salmon. It’s hard to find cheap, tasty salmon on campus (and I don’t fully trust myself cooking fish), but Glaze’s salmon always satisfies my cravings. The side salads are delicious too. Glaze opts out of using cheap iceberg lettuce and instead goes with dark greens, which contain more vitamins and minerals. My favorite salad dressing is the honey lemon dressing. It’s light and sweet and compliments the teriyaki taste magnificently. In all honesty, I usually ask for an extra dressing or two to take home for my own salads. 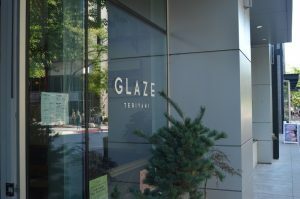 As if the delicious meal wasn’t enough, Glaze keeps its prices relatively low (for the amount of good food you receive) and offers a handy punch card: buy 10 meals, get one free! Get a sweet tooth but is a health freak? Welcome to the world of Banana Sushi!